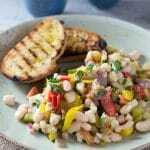 A warm easy bean salad with yellow pepper, eggplant, tomatoes, garlic and delicious fresh herbs. This makes a perfect Summer dinner or lunch alongside some char grilled crusty bread. Remove the seeds and white from the pepper and finely chop that and the onion and eggplant. Add to a large frying pan with 1 tbsp of olive oil and cook down, stirring occasionally for 10 minutes. Meanwhile, remove the seeds from the tomatoes and finely chop. Add to the pan with the finely chopped garlic and oregano, stir. Fry for another 5 minutes. Add the cannellini beans and remove from the heat. Add the lemon zest, parsley, basil and a good pinch of salt and pepper, Stir to combine. Serve with some char-grilled crusty bread. Cut slices of ciabatta bread and drizzle with a little olive oil. Place on a hot griddle pan until toasted and slightly charred on each side, sprinkle with salt. Tip: This is especially good with goats cheese spread on top with this salad.